It was a phenomenal day for all who gathered to recognize Matt, a Marine, who, during his third deployment to Afghanistan, lost both his legs and fractured his pelvis while serving our country. After several surgeries and then rehabilitation, he seeks to use his injuries as a way of connecting with others who have been severely wounded, especially other service members. 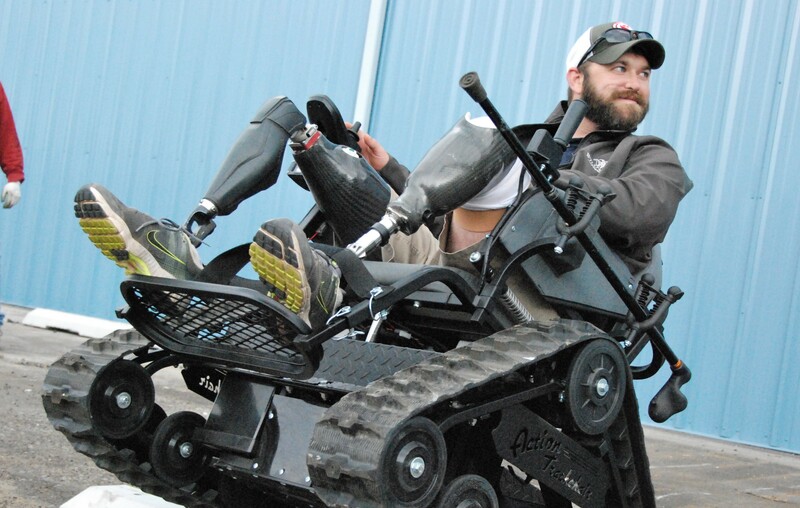 Matt is an avid hunter and fishermen, but with prosthetic limbs, he hasn’t been able to manage the terrain and gain the balance he needs to engage the outdoor settings, much less while carrying a firearm or fishing gear. 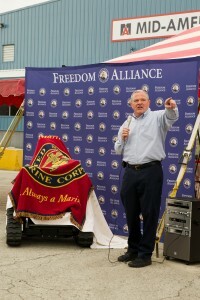 We at Freedom Alliance are thrilled to say that we were able to present this Marine with a custom-made, all-terrain “Action Trackchair,” which will give Matt back his freedom to participate in the outdoor sports he so enjoys. This happened because of generous support from corporate donors Hodgdon Powder Company, distributor of smokeless ammunition powder, and Mid-America Fittings. The formal presentation of the chair was held at Mid-America Fittings, which is in Overland Park, Kansas—Matt’s home state. The owner, Scott Shane, is also a former Marine, and his company’s employees are made up of 50 percent military veterans. For this special day, Scott shut down the business and invited the employees and their families to come out and celebrate Matt and share a barbecue meal. Kilgannon was followed by Bob Hodgdon, of Hodgdon Powder, and Scott Shane. Scott presented Matt with some accessories for the chair that his team specially crafted, including a fishing pole holder and gun rack, and a brand-new compound hunting bow. Matt, accompanied by his wife, Audrie, and their two children, accepted the gifts with many thanks. Then he happily test-drove the track chair over concrete curbs and wooden pallets, even through a puddle of mud, to the amazement of all, who felt so good to be involved and see this local hero properly rewarded.